Tributes have been paid to five-time world champion Eric Bristow, who has died aged 60 after suffering a heart attack. 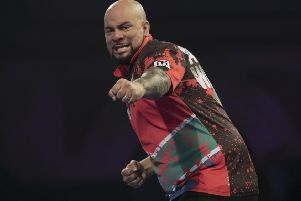 The Professional Darts Corporation announced the passing of the ‘Crafty Cockney’ during Thursday night’s Premier League fixture in Liverpool. Immediately after the news broke, fans at the Echo Arena burst into a rendition of “There’s only one Eric Bristow” as commentator Rod Studd stopped speaking. It was a fitting tribute to the man PDC chairman Barry Hearn described as “a legend”. One of darts’ first superstar players, Bristow won his five titles as a player in the British Darts Organisation, dominating the sport between 1980 and 1986. His first title, a 5-3 defeat of Bobby George, marked the start of his dynasty. His friendship with Phil Taylor saw him mentor the ‘The Power’ to become the greatest player of all time while he eventually moved into broadcasting with Sky Sports, combining commentary duties with working as a spotter, plotting checkouts for the players. “Eric will always be a legend in the world of darts and British sport. He was a tremendous player and a huge character and even after his retirement fans would travel for miles to meet him and see him play,” Hearn said. The unexpected death of Bristow cast an immediate shadow over events in Liverpool - commentator Stuart Pyke said Bristow had been at the arena during the action before his heart attack. As news broke, the players on stage - Peter Wright and Daryl Gurney - and Sky’s commentary team were unable to contain their emotions with all in tears. Keith Deller, the 1983 world champion - beating Bristow in that final - said on stage: “I am devastated. Me and Eric were together all the time. “What he has done for our game, I mean if it wasn’t for Eric nobody would be here tonight. “It is a massive loss to our sport. He said what he thought and it was his honest opinion. Everyone loved Eric for that. “When he was playing darts, in our day, he had the self belief to win every tournament. “It was a long time ago when I won the World Championship. To beat Eric in the final, it could not have been any better for me. “If you look at the stars we have had in Britain, Eric Bristow would be at the top. Former player Wayne Mardle, who is now a commentator, said Bristow was the reason why he took up the game. “I would never have picked up a dart without Eric Bristow,” Mardle said. “Eric will go down like an absolute superstar of sport. From all walks of life, people know who Eric Bristow was.